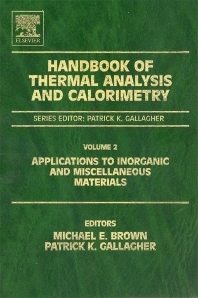 Handbook of Thermal Analysis and Calorimetry, Volume 1: Principles and Practice describes the basic background information common to thermal analysis and calorimetry in general. Thermodynamic and kinetic principles are discussed along with the instrumentation and methodology associated with thermoanalytical and calorimetric techniques. The purpose is to collect the discussion of these general principles and minimize redundancies in the subsequent volumes that are concerned with the applications of these principles and methods. More unique methods, which pertain to specific processes or materials, are covered in later volumes.